Meen peera “Fish stir fry with coconut” is an exclusive Kerala fish curry. Its also an easy to prepare fish curry with minimum steps. 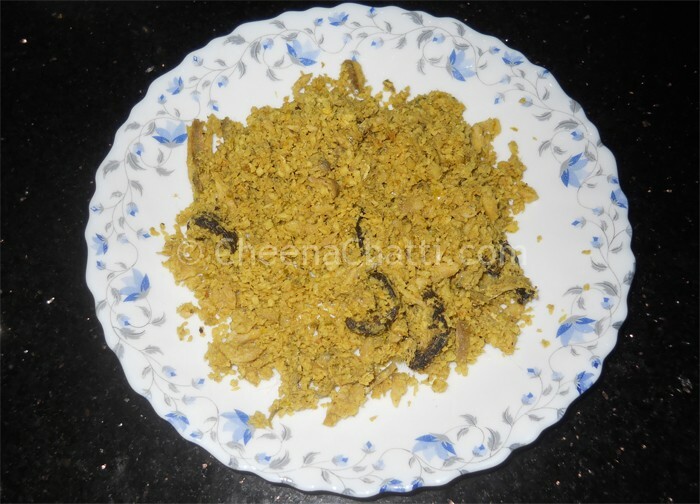 Usually Keralites prepare Meen peera with the small fish Anchovy (locally called as Chooda or Natholi). Some time even small sardines are also used. Meen peera is usually served as a side dish for boiled rice. Soak the gambooge in water for half an hour. Clean the Anchovy (Natholi / Chooda) / Small Sardine (Mathi) well and transfer it to an clay pot (or a pan) with water. Coarsely crush the shredded coconut, ginger, garlic, green chillies, shallots, turmeric powder (#3). Add salt, mango pieces, curry leaves to the earthen pot. Add the ground paste to the pot. Slice the soaked gambooge and add it to the pot. Cover it and cook it for 15-30 minutes (depending on type of fish), till the fish is done, in medium flame. Uncover it and let the water evaporates completely. Add coconut oil and mix it well in low flame for 2-3 minutes. As we are using both mangoes and gambooge together, it may become more sour. You can adjust the sourness by removing excess gambooge pieces while cooking. Have you seen other thoran recipes? This entry was added on September 13th, 2013 by Renoos in Non Veg and tagged with kerala meen peera, fish, fish curry, kerala fish curry, meen peera. Last revised on April 4th, 2018.